The typical problem with the study of tremolo is that most players want to start playing it as such. It is such a complex and at the same time relaxed guitar technique that only those players that approached the study of tremolo in the right manner will eventually play a beautiful tremolo. You must become very good friends with your metronome, and if the metronome is not yet one of your best practice friends, you better considering making him one urgently. I recommend the old style pendular ones because they also train your eye sight and this comes in handy when playing with other musicians. Start off at 80 beats per minute and increase gradually. Only increase the speed when you are able to play flawlessly for 30 seconds non stop. No exceptions. The training of the fingers in the performance of tremolo starts by feeling each string with the tip of each finger. Feeling the strings makes the right hand feel secure because she's most too often neglected your sight to guide her, therefore, she has to develop her own sense of sight and that is the sense of touch. Depicted above is the millisecond that precedes the plucking of the second string during tremolo. 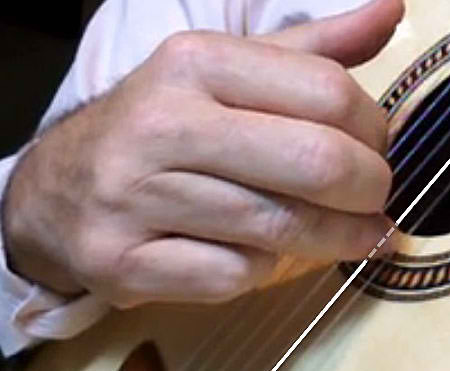 The flesh at the tip of the a finger is touching the string and is acting as a staccato. By forcing the right hand to plant on the string, you are teaching the hand how to stay very close to the strings at all times and you will be using the larger more effective muscle groups in the hand. Touching the string gives you control on the exact sound you want to produce. Following this frame comes the plucking itself. The nail goes through the string and, depending on the angle at which you attack the string you will achieve a fuller or thinner sound. The palette you can achieve depending on you mastery and the quality of your instrument is practically speaking endless. This sequence is repeated relentlessly during tremolo piece. The trained hand will do its work and will only need minor adjustments from the player. Understand the concept of planting. I often refer to it in my teaching as feel the string. What you do is develop teh sense of touch to the point where you feel each note being created at the tip of your finger.